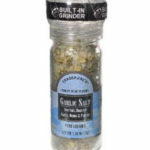 This is VERY close to the old Armanino Foods product Garlic Zing, which was discontinued years ago. Has real zing, and delicious. I just tried this by spread it on TJ sourdough crackling wheat bread and then added TJ pesto spread. I have been coughing for over a month and my Drs couldn’t cure me. only wanted to give me loads of anti biotics. No more. This cured me! THIS DID? Thanks Trader Joes. This is soooo delicious. Lemony zing to it too. Tastes like garlic dip at Zankou chicken too for those that love it like me. Enjoy! I agree it does taste like Zankou Chicken’s garlic spread!!! 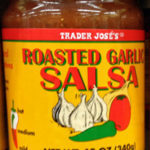 Sooo good I’ve been waiting for a local grocery store to carry garlic spread, and Trader Joe’s did it! I love it. Dip some pita bread in it and it’s amazing. Or eat it with one of your favorite mediterranean wraps. This stuff is AMAZING, if addictive. The only downside is that you will sweat it out of your pores the next day and your co-workers will follow you around asking if you’ve been eating garlic bread (which is a small price to pay for how delicious this is). I like to serve this with warmed up gluten free flatbread. This stuff is amazing and reminds me of the “garlic sauce” we used to get at a now closed Lebanese market in St.Paul, MN. 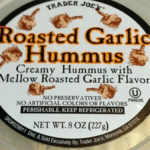 It is delicious just spread on some flatbread or a tortilla and rolled up. I’ve bought 4 containers since finding it at my local TJs in Minneapolis just a month or two ago!! Now bring the Middle Eastern Flatbread to the Midwest, please! Having this with crackers right now… I’m thinking of putting this with some sauteed zucchini or broccoli on a baked potato! OMG… this stuff is wonderful.. This stuff just debuted at my local TJs. I tried it at the demo station and had to have a tub of my own. So I brought it home and my wife hesitantly tried it. She proceeded to eat a solid 1/4 of the tub with crackers. For dinner, I decided to make a flatbread “pizza” and toasted a slice of TJs flatbread, smeared it with this Garlic Spread, covered it with mozzarella and sliced grape tomatoes, and topped it with arugula and some balsamic glaze. Amazingly good! The next day, I made a prosciutto sandwich with TJs Chabata rolls, TJs prosciutto, TJs roasted red peppers, TJs arugula, and, of course, TJs Garlic Spread. It was SO GOOD!!!!!! After lunch, I went back to TJs for some items we couldn’t find at our Sunday Farmer’s Market, and picked up a second tub of the Garlic Spread. It is Wednesday and the tub is about 75% gone again. I highly recommend it, and hope TJs doesn’t discontinue it any time soon! ….is the garlic sauteed or baked first? (I doubt that it is raw)…. anybody? It seemed too sour to me like it had gone bad. And the texture was strange. I’m going to try and add to cooked veggies or something to add xtra garlic taste. Other than that I didn’t like it as a dip for crackers! Going to experiment before I throw it away. I’m thinking garlic chicken wings! This stuff is basically mayo, but garlicified. Amaaaazzzzzing as a sandwich spread or even straight with crackers or veggies as a dip. yuck, the first taste and i was ready to take it back for a refund. i thought maybe i just got a bad batch, but im not going to waste the money to try it again. This stuff is FABULOUS!!!!!!!!!!!! I make a chicken stir fry add a tbsp on top – so so so good! I hope they never discontinue this!! This is ridiculously good. It really tastes like similar dips from Mediterranean restaurants I’ve been to. I like that it has a simple list of ingredients (although of course it’s not exactly healthy and is pretty high fat). 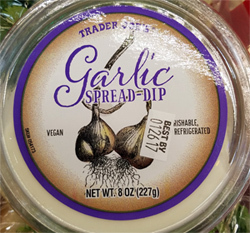 Having used this both as a dip and as a spread, I can confirm that it tastes amazing as either! 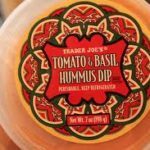 It also lasts a good amount of time before expiring, which isn’t always the case with refrigerated dips. If I could rate this 10 stars I would. Seriously it is addictive. I bought a tub last week and am going to buy two more tubs this week, one for home and one for work. I love it with grilled chicken breasts, on a flatbread, dip for veggies, maybe just a little spoonful! I LOVE this dip. Definitely tastes like the Garlic Dip you can find at many Middle Eastern/Mediterranean restaurants. I buy two of these every time I go to trader joes. I eat it as a dip with crackers or veggies, eat it with steak, or eat it with gyros. 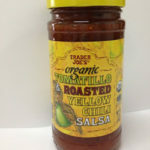 I am a Native New Yorker and I recently attended a board meeting in San Antonino TX well they serve us lunch and this container just siting there I open it up and WOW I am in love with it delicious I came back to NY and of course bought like 4 containers since I also love to cook I took chicken and after preparing to season i just took the garlic and gave the chicken a good massage in the oven and it came out delicious so I will also try to add to my pasta and make a white pasta more delicious so I can go on and on how happy and addicted I got to this spread! This my friends is Lebanese Toum. Have it with fried chicken or regular chicken and some diced pickles and you’ll fall in love.